Winter’s end brings hope for brighter days and warmer temperatures. Unfortunately, spring also ushers in its own challenges and unique safety issues. There’s a lot more to spring cleaning than vacuuming up the dust mites that accumulated over the cold, dark months of winter. The fresh start of spring is the best time to ensure your home is safe, prepared, and nontoxic for another year. As the snow melts and the sun starts to shine longer and brighter, keep this checklist handy to help you avoid any potential perils this spring and to provide a safe home for your family. The first whiff of spring prompts do-it-yourself dynamos to begin beautifying their yards. Digging, planting, mowing, and trimming can be surprisingly strenuous after a winter of inactivity, so minimize your chances of limping back into the house. Stretch before vigorous activity, lift with your legs, use well-maintained tools, and break up heavy loads into multiple trips. A big part of staying safe is dressing for the part. Depending on the activity you will be participating in, make sure you’re using the proper safety equipment: wear safety goggles, sturdy shoes, and long pants, as well as gloves and ear protection if necessary. Indoor air can be up to five times more polluted than outdoor air — especially during the winter when we trap our indoor air inside with us. To help improve your indoor air quality, air out your house while spring cleaning, and clean or replace the filters on your air conditioning unit and furnace, as well as your dryer, vacuum, range hood, and refrigerator. Use organic cleaners to help minimize the risks associated with toxic cleaners. Be aware that “natural” does not necessarily mean “nontoxic,” and carefully review labels for dangerous chemicals before purchasing any cleaners. You could also make your own household cleaners out of common household items, like vinegar and lemon juice. To verify your smoke detectors are in good working condition, test each one individually. Ask a family member to stand as far away as possible from the detector you are testing — it’s vital that your family can hear every detector from anywhere in the house — then press and hold the test button on the detector. If it doesn’t let out an alarm loud enough for your assistant to hear, change the batteries and test it again. If it still doesn’t work, replace the detector as soon as possible. You should have a carbon monoxide detector outside every room and on every level of your home, and check the batteries in each one every month. The gas sensors in CO detectors have a limited lifespan — and the test button tests only the battery, not the sensor — so replace or recalibrate your detectors at least every five years, even if the detector still beeps when you push the test button. Take advantage of the new season by reviewing your disaster preparedness plan with every member of your household and update it to reflect anything that may have changed in the last year. Your plan should include at least two rendezvous points, an emergency contact person, and an evacuation route. Once you have reviewed the plan, run a few drills for the natural disasters that can occur in your area, like fire, flooding, and earthquake. Properly dispose of all expired and unused medications in your home. Many medications are considered too dangerous to throw away or flush down the toilet, so call your pharmacy or local poison control center to find any drop-off sites that will take your expired medications. Check your first aid kit and 72-hour kit and replace any missing or expired items. Make sure you have all the essentials, including bandages, water, and emergency phone numbers for the local poison control center and your family physician. Every home should have at least one fire extinguisher in an easy-to-access location. Although fire extinguishers can have a long shelf life, they do eventually expire — and once they do, they are useless in a fire. Make sure you check the expiration date on your fire extinguishers and keep them updated. Don’t leave tools, valuable equipment, or cellphones lying around your lawn, which may invite dishonest people to take advantage of your carelessness. Remember to engage your alarm system, and check your window frames to make sure winter moisture hasn’t caused any warping which would leave them vulnerable to a break in. You mat also want to make a call to your security company to check if there are any updates or changes to your system you should be aware of. If your house isn’t safeguarded with a security system, make time during your spring cleaning to find a reliable security company that works for you and your family. If winter buried your house in snow, start preparing for the spring thaw. As snow melts and refreezes, ice can build up in “ice dams” and slide off your roof — taking shingles, gas lines, or electrical meters with it and causing leaks and fire hazards. Fallen ice can also cover and block vents, forcing carbon monoxide back into your house. Clear any snow or debris off your roof and check your gutters for proper drainage to avoid flooding. Turn your sprinklers back on, but watch out for cold spring nights that may cause frozen pipes — or pipes that froze during the winter without you realizing it. Trim back dead trees and shrubs before they can fall and cause injuries and carefully trim back any branches that have grown too close to electrical wiring. Clear overgrown plants from walkways and reposition any dislodged stepping stones or other garden decorations to avoid tripping hazards. Cleaning your chimney will help reduce the risk of fire as well as carbon monoxide buildup. This same principle goes for your roof gutters: not only is the buildup of debris a fire hazard, but if your area is prone to rainfall, dirty gutters are a flooding hazard as well. According to the Center for Disease Control (CDC), thousands of people are stung by bees and other insects each year. These can range from minor irritations to serious allergic reactions and even death. If you get stung or bitten, stay calm and treat the area immediately. Seek medical attention if the site gets red and swollen or if you have trouble breathing. Spring showers don’t just bring May flowers, they also make the roads slick and potentially treacherous. Warmer weather also means more cyclists and children playing outside, increasing the need for driver diligence. To keep yourself and others safe on the road, schedule a vehicle maintenance check to ensure tires, wipers, and brakes are functioning properly. Spring is a wonderful time to work and play outside and check items off your home to-do list. By maintaining vigilance and caution, you stay safe and healthy and cruise into summer concussion- and cast-free. 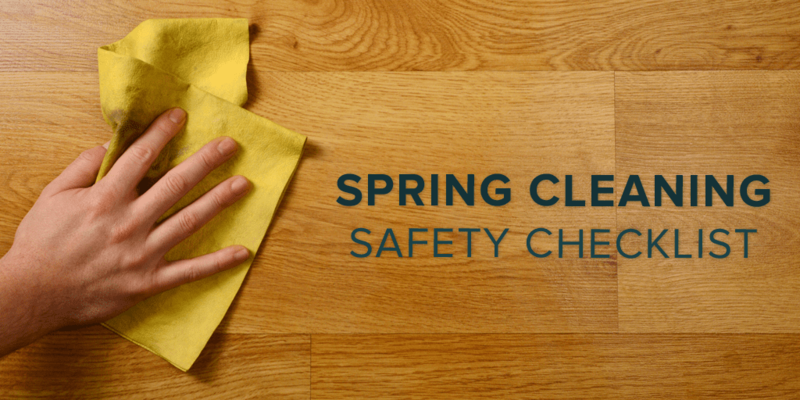 Use this checklist as a guide to keep safety in mind while spring cleaning your home.